I never thought to obtain Letters Patent from the Queen for a monopoly on Oxford Gloves®, nor for the licensing of The Earl of Oxford’s Perfume™. That’s some serious branding I missed. Think of the fees. The income side of financial management was never my forte. I was curious to see how my glove story morphed, over forty-four decades, from what really happened in 1576 (which I related in Part 1), into what people find today, when they read it as a bit of fluff in a biography of Elizabeth, or in tales of life at her court, or in books about Elizabethan fashion. I wanted to trace it back from the present, to uncover the beginning of the Oxford glove meme. This isn’t meant to be an exhaustive survey, though it may be exhausting. There are breaks. Sources are listed at the end, after the pentameter. ● Most recent first. The Ephemeral History of Perfume: Scent and Sense in Early Modern England, by Holly Dugan, published in 2011. This is a bad beginning. I’ve been called a lot of things in my day, and many more since, but Sir Edward Nevarre is a new one. Not one of the other sources we’ll see that ‘widely recount’ my meme make this mistake. Ms Dugan has me home after my fifteen-month trip in 1566, when I was all of sixteen years old. A decade too soon. Don’t people check these things? I’m almost certain that the internet existed in 2011. If it’s a typo, it’s still a proofreading error, and that doesn’t explain the butchering of my surname. My Italian gloves were not the first perfumed pair in England, as I explained in Part 1. Only the scent was novel. As for the fashion’s spread, Oxford gloves were well established well before the 1590s. She’s a decade off again, in the other direction. But the last sentence is a nugget of gold among the dross. It was news to me that at the end of 1592, a Dr Thomas Holland, Rector of Exeter College, Oxford, sent my ex-father-in-law [Anne had died in 1588] a pair of Oxford gloves as a New Year’s gift. I had a fine laugh, 425 years after the fact. Was Holland playing a prank, or was he just clueless? I can’t imagine that it went over well at Theobalds. I’d have loved to have seen Cecil’s face when he opened the package. Chapter 5, ‘Oiled in Ambergris: Ambergris, Gloves, London’s Luxury Markets’, from which this excerpt comes, is an interesting read. But when, in such a short selection, you see so many statements carelessly written or demonstrably incorrect, in a recent work where fact-checking and proofreading are so easy to do, you wonder how much else in the book is also this wrong. Caveat lector. ● A tome from 1938, reprinted in 1997. Tudor Costume and Fashion, by Herbert Norris. It’s a 900-page illustrated reference of, well, Tudor costume and fashion. The date’s less wrong – here I return from the Continent only two years before I left. All those other ‘pleasant things’ became pirate plunder, so perhaps Norris or his source is referring to the replacements I had made after I got back. Everyone expected souvenirs, I had to improvise. He’s wrong about the odour of the Queen’s gloves being common unless he’s counting the knockoffs, but he makes the correct point that Oxford gloves had nothing to do with Oxford the place. There’s a brief, not-too-judgmental bio of me in this book. I’ve read much worse.1 Norris uses a drawing based on my Paris portrait to describe the new fashion in 1570s hats, linking it also to my tour of Italy, though the hat is French. And the year’s still wrong. Those hats were a mistake. In blustery weather they took off like kites. Urchins chased them in the street, and refused to give them back until you paid. I must have bought that one three times over. My fashionable friends were similarly extorted. Norris doesn’t source the meme, so no help there. ● The 1 January 1852 issue of Godey’s Lady’s Book, an American women’s magazine popular in the mid-19th century. In an article entitled A Gossip About Gloves, the author ‘Mrs White’ propagates the meme. There are clear similaries to Norris, pointing in the same direction. A connection back to Part 1: After referring to gloves in the works of Shakespeare (not shown here, but see the source link below), Mrs White gives her genteel readers the vapours with this florid description of unbridled female malevolence. Perfumed gloves are the ‘pretty fashion’. Small wonder that people get such bad reputations. The poison is in the pen, not the gloves. Despite the assertions that Bess sat for pictures in her Oxford gloves, I haven’t seen them in any of her portraits, most of which date from later in her reign. There are of course no photos – aside from the non-existence of photography, the gloves simply wore out from use. The glover finally refused to repair them any more. They looked like her Guinea pig had been at them, but the scent of Acqua della Regina still lingered. Here’s a different glove, one that survived. It was only worn once. Elizabeth wore this glove (and its missing mate) for her coronation on 15 January 1559. I was eight years old and away at Cambridge, but my father did his duties at Westminster Abbey, as Lord Great Chamberlain of England. The glove is now owned by Dents, a glove purveyor. A GLOSSARY; or, Collection of Words, Phrases, Names, and Allusions to Customs, Proverbs, etc., which have been thought to require illustration, in THE WORKS OF ENGLISH AUTHORS, particularly SHAKESPEARE AND HIS CONTEMPORARIES. ‘…the sort which perfumed the queen’s gloves’ are the bad knockoff scents I spoke of earlier. Nares cites ‘the continuator of Stowe’, and ‘Mr. Warton’.2 He gives the year of my return from Italy as ‘the 15th of [the reign of] Elizabeth’. That’s 1573 again; 1576 was the 18th of the reign. But the name Stowe rings a bell in my head, and there’s a page number, 868. Remember that. These gloves are said to have been Elizabeth’s. They’re in the collection at Alnwick Castle in Northumberland, stronghold of the Percy family. Elizabeth never travelled that far north, but they could have been brought in from elsewhere. The Percies had some doings with Elizabeth’s mother at one time, so who knows. There are photographs of 17th century gloves at the website of the Glove Collection Trust, whose trustees are appointed by The Worshipful Company of Glovers of London. They’ve been around since 1349. 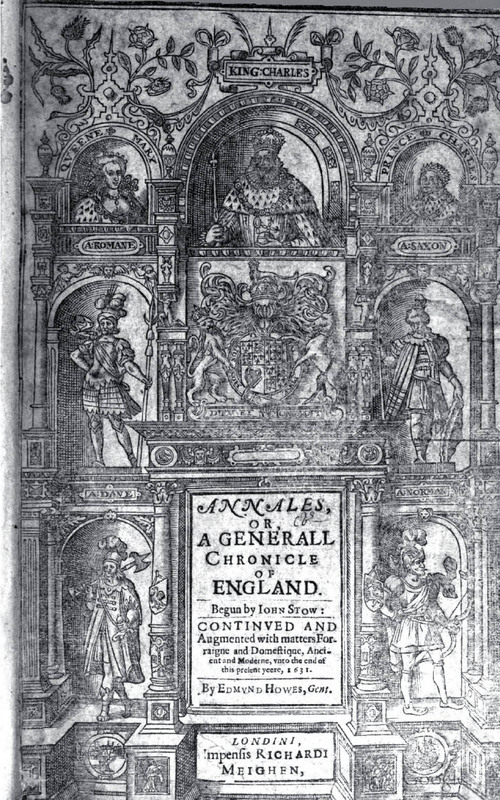 ● In 1580, antiquarian John Stow (not Stowe) published his Annales, or a Generale Chronicle of England from Brute until the present yeare of Christ 1580. I knew his name was familiar, we’re in my own lifetime now. The Annales was updated several times between 1580 and Stow’s death in 1605, then ‘continued’ by Edmund Howes, who published his extended editions in 1615 and 1631. 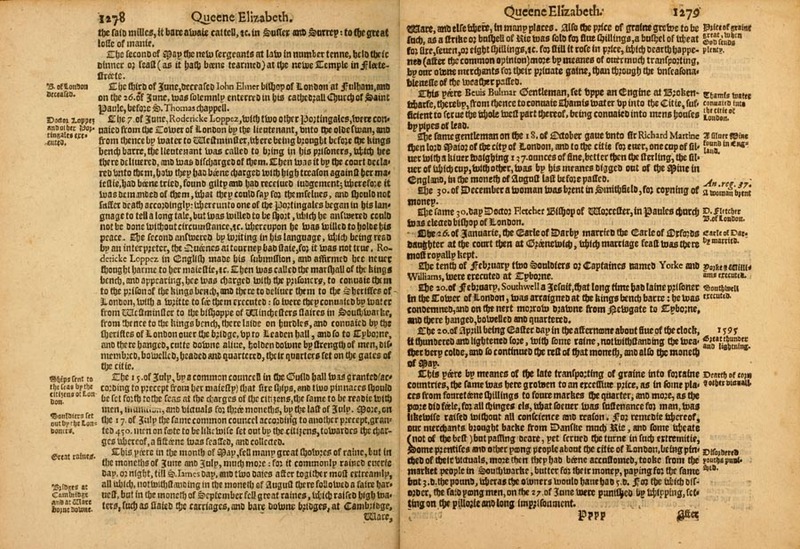 The first Annales I found was from 1603 – the date is presumed because the title page is missing, but the volume ends with Elizabeth’s death so it’s a good guess. If Nares was correct, I had overshot my target. I thought I’d have a look around anyway. Click on the image to see it in more detail. S’blood, hand me the Rhenish. Textualis, Gothic bookhand, blackletter. Whatever you call it, it’s very old-school type. This book is just 20 years older than the First Folio, but visually it’s closer to Caxton. This is the type of type that I grew up reading, when I wasn’t reading manuscripts. The 26. of Januarie, the Earle of Darby married the Earle of Oxfords daughter at the court then at Greenewich, which marriage feast was there most royally kept. My eldest daughter (probably, though I still have my doubts) Elizabeth, born in July of 1575 while I was away on my travels. She was married to William Stanley, 6th Earl of Derby, at Greenwich Palace. The Queen and all the court attended. Grandfather Cecil arranged the match. Don’t get me started. You know the debate over whether A Midsummer Night’s Dream was written to be the entertainment at a marriage feast most royally kept? It was. I wrote it for my daughter, who adored it. Sometimes it’s so simple. I had planned to joke about Willy Shakspere picking up some tradecraft as a boy, hanging around his father’s un-recreated glove shop in Stratford-upon-Avon when he wasn’t translating Ovid and Aristophanes at the local grammar school. It seemed like low-hanging fruit, so I decided not to. ● I needed to find a Howes-continued copy of Stow. Most of the time I’m limited to what’s on the internet, as it’s difficult for me to gallivant around the globe in search of dusty volumes in libraries and old archives. I don’t get grants. In 2010, Google digitised a copy of Howes’s 1631 Annales from the Bayerische Staats-Bibliothek in Munich. The PDF was free to download. The next time you’re annoyed by adverts at the top of your Google searches, remember this. Click to see it in more detail. Up top in the regalia is Charles I, the king whose high opinion of himself caused his head to swell beyond popular limits, prompting its removal. The tune is Chopin’s ‘Heroic’ Polonaise in A-flat major, Op. 53. The scans are low-res, not in colour, and there appears to have been a lot of water damage or other misfortune. Even if 868 was the right page, would it be readable? I held my breath and scrolled. I see little risk in concluding that all the later references derive from this source. I’ve found my meme.4 Even the mistakes are here, excepting Ms Dugan’s. Edmund Howes’s creative punctuation caused the misdating of my return from Italy (nobody in four centuries bothered to check it for themselves), and there’s the list of things I had to replace after the originals were stolen at sea. But what’s it doing under The life and Raigne of King James.? That’s not where I expected to find it. Page 868 describes how increased immigration and the expansion of foreign trade in the late 16th century fostered prosperity in London during James’s reign, and Howes seems to have felt that my exploits as an early, though non-commercial, luxury-goods importer deserved mention. It’s the only answer I have. Read it for yourself. Bring aspirin. They nearly did. Two of the blackguards held their daggers to my throat while three more argued over who should have the gloves, which they all knew would fetch a pretty price. It was a stressful moment, but I rose to the occasion and responded with some impromptu deliberative oratory. What’s he that wishes these? And Lord Great Chamberlain of England too. Who anxiously awaits my safe return. Her royal wrath will fall upon on your heads! Then after to be nought but food for fish. Let Oxford give Elizabeth her gloves. Some of that speech came in handy later on. The Oxford DNB, for one. Talk about a poisoned pen. Monstrous. Warton eluded me. Thomas Warton the Younger, literary historian and Poet Laureate, 1728 – 1790. Since he followed Howes by over a century, and considering what Nares credited to him, I figure he was retelling Howes anyway. If I knew what work Nares was citing I might have kept on with the search, but without a title the game wasn’t worth the candle. I played an early sort of Bingo while I was in Italy. Tried to teach my literary minions at Fisher’s Folly to play it for stakes, but they were too addicted to their card games and bowling. It caught on later, though. I wasn’t able to ascertain whether my meme also exists in Howes’s earlier 1615 continuation, since I didn’t find a copy of that edition. If the meme is there too, would the page number be the same? My guess is no, but if anyone has access to a copy and feels like checking, or sending me a link that I can get to, I’d write you a sonnet. Or a limerick. Send me a direct message on Twitter (@edevere17). The only question it might answer would be the date of the meme’s origin, 1631 or 1615. I’m not losing any sleep over it. If I have to explain a Spinal Tap pun to you in 2017, then the Shakespeare Authorship Question might be the least of your worries. Posted on 18 March 2017 5 April 2019 by @edevere17Posted in A Midsummer Night's Dream, Henry V, History, Literature/Writing, Other Writers (before 1900), Other Writers (since 1900), Personal Stories, ShakespeareTagged Animals, Catherine de' Medici, Charles I, Cinema/Television, Clothing/Fashion, Commerce, Elizabeth de Vere Stanley/Countess of Derby, Elizabeth I, Fisher's Folly, Google Books, Internet Archive, Italy, James VI/I, John de Vere/16th Earl of Oxford, John Stow, Marriage, Money, Monty Python, Pirates, Spinal Tap (band), St Crispin's Day speech, Travel, Welbeck/Paris Portrait, William Cecil/1st Baron Burghley, William Shakspere of Stratford-upon-Avon, William Stanley/6th Earl of Derby.